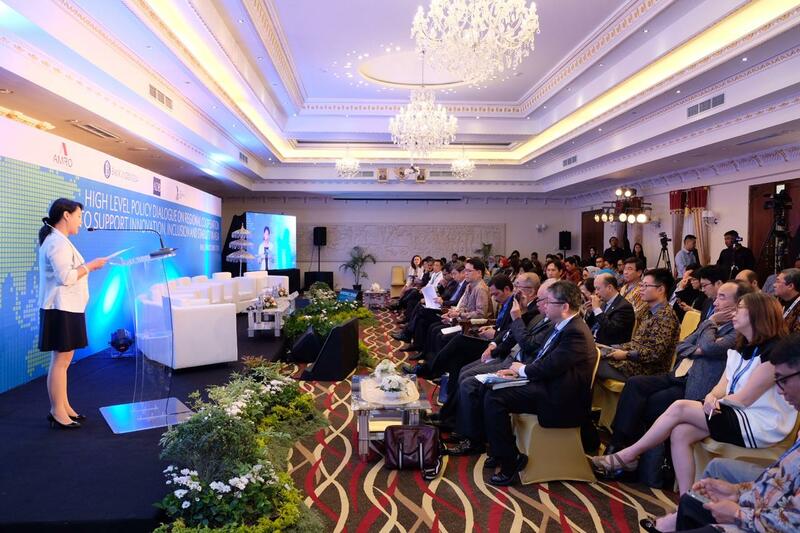 BALI, INDONESIA, October 11, 2018 — Asia’s policy makers should strengthen cooperation to harness the potential of new financial technologies for inclusive growth. At the same time, they should work together to ensure they can respond better to the challenges posed by fintech. New technologies such as mobile banking, big data, and peer-to-peer transfer networks are already extending the reach of financial services to those who were previously unbanked or out of reach, boosting incomes and living standards. Yet, fintech also comes with the risk of cyber fraud, data security, and privacy breaches. Disintermediation of fintech services or concentration of services among a few providers could also pose a risk to financial stability. 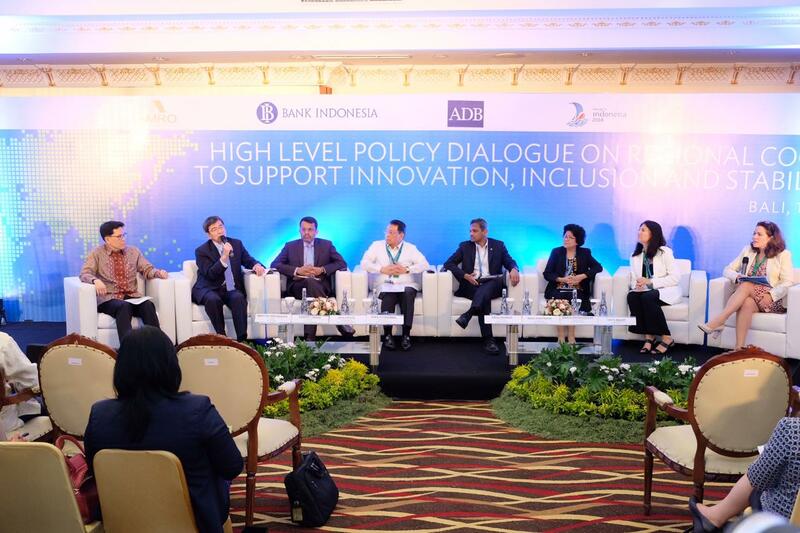 These and other issues were discussed at the High-Level Policy Dialogue on Regional Cooperation to Support Innovation, Inclusion, and Stability in Asia, organized by the Asian Development Bank (ADB), Bank Indonesia, and the ASEAN+3 Macroeconomic Research Office (AMRO). The panel comprised Ms. Neav Chanthana, Deputy Governor of the National Bank of Cambodia; Mr. Diwa Guinigundo, Deputy Governor of Bangko Sentral ng Pilipinas; Ms. Mary Ellen Iskenderian, President and Chief Executive Officer of Women’s World Banking; Mr. Ravi Menon, Managing Director of the Monetary Authority of Singapore; Mr. Takehiko Nakao, President of ADB; Mr. Abdul Rasheed, Deputy Governor, Bank Negara Malaysia, and Mr. Veerathai Santiprabhob, Governor of the Bank of Thailand. Mr. Mirza Adityaswara, Senior Deputy Governor of Bank Indonesia, gave the opening remarks at the conference and Ms. Junhong Chang, Director of AMRO gave the welcome remarks. Distinguished panelists discuss innovation, inclusion, and stability in the East Asian region. Despite Asia’s high economic growth in recent years, the financial sector is still under-developed in some countries. Fewer than 27% of adults in developing Asia have a bank account, well below the global median of 38%. Meanwhile, just 84% of firms have a checking or savings account, on a par with Africa but below Latin America’s 89% and emerging Europe’s 92%. Financial inclusion could be increased through policies to promote financial innovation, by boosting financial literacy, and by expanding and upgrading digital infrastructure and networks. Regulations to prevent illegal activities, enhance cyber security, and protect consumers’ rights and privacy, would also build confidence in new financial technologies. The ASEAN+3 Macroeconomic Research Office (AMRO) is an international organization established to contribute to securing the economic and financial stability of the ASEAN+3 region, which includes 10 ASEAN countries and China (including Hong Kong), Japan, and Korea. AMRO fulfils its mandate by conducting macroeconomic surveillance, supporting the implementation of the regional financial arrangements, the Chiang Mai Initiative Multilateralisation (CMIM), and providing technical assistance to the members.